The church was built in 1907 on land previously occupied by the congregation's chapel. 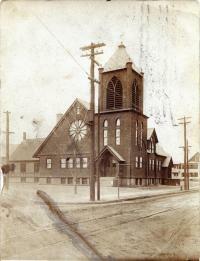 The congregation moved to the corner of White & Sumner in 1927, and the building was sold in 1928. I don't know when it was demolished. Submitted by Anonymous on Thu, 02/07/2019 - 11:52. I just found a lot of items pertaining to this church. All are from around the dedication in 1909 including a mounted photo, postcards, newspaper clippings and 2 dedication programs. Any interest in them? I am listing the lot on ebay if you are. Submitted by Barbara Shaffer (not verified) on Wed, 09/19/2012 - 16:38. Submitted by laroo (not verified) on Tue, 09/18/2012 - 21:30. Submitted by Ralph Slate on Wed, 04/18/2012 - 01:01. The Emmanuel Congregational Church was located on the present site of the Little Panda Chinese Restaurant/Lift the Latch bar. Which corner at White and Orange was this church located? Submitted by Anonymous (not verified) on Tue, 04/17/2012 - 01:55. At which corner was this church located? The one with the shops? The one with the gas station? The one with the Panda restaurant? (I doubt it's the fourth one.) My guess is the one with the shops because there is so much empty space behind them. As for what happened to the church, I can't find any newspaper articles about it's closing. Submitted by Anonymous on Tue, 03/19/2019 - 14:46. While i heard that Google had introduced "chrome", I had to go and check it out. Submitted by Ralph Slate on Mon, 03/23/2009 - 22:42. Yes, you're right -- thanks for pointing that out. I always seem to get those two streets confused. I have made the correction. Submitted by Brenda (not verified) on Fri, 03/20/2009 - 15:53. I think you mean the church was on the corner of White and Orange Streets. Oakland Street doesn't intersect with White Street. Submitted by Jim Boone (not verified) on Mon, 02/09/2009 - 08:10. White Street Congregational was organized in 1888 and became Emmanuel in 1894.